Mattresses come in a variety of sizes, but there is significant confusion as to what these sizes mean, much less who would be comfortable on such a bed. Here, we’ll explain what each mattress size means and the variations you may find on the market. We’ll also provide mattress size information in commonly used units and compare mattress sizes to each other. The standard twin mattress is 38” or 39” wide and 75” long. For metric users, this is roughly 97 cm by 191 cm. They’re regularly called “single” or “cot” mattresses. The height of mattresses varies. The standard bed frame has a thickness of 7” while the standard box spring is 9” thick. These are the smallest standard size of mattress available. They’re typically given to children, though shorter adults can also sleep on them. The “twin” name refers to the fact that you can easily fit two beds this sized in children’s bedroom so that two children can share the same space. This is the mattress you find in day beds, bunk beds and guest room beds. You can sometimes find mattresses called a “small” twin bed, though in the UK they are called small-single beds. The small single or small twin mattress is 30” by 75” and used in toddler beds. We’re not going to provide mattress size information for crib mattresses since there is so much variation in that area. See The best twin mattresses. A twin XL or twin extra long mattress is 38” or 39” wide and 80” long. This is five inches longer than the standard twin mattress, hence the XL in the name. These beds are designed for taller children while still allowing parents to fit two beds in the same bedroom. You want a mattress that is taller than the tallest person sleeping on it, and this is the longest child sized, commonly available mattress on the market. The longer length makes them suitable for young adults; this is why they are often found in college dorm rooms as well as guest bedrooms. If you own a king sized adjustable bed, where each side of the bed can be angled or elevated based on the person’s preferences, you could just order two twin sized XL mattresses to fit it. Note that while mattresses come in standard sizes plus or minus half an inch, bed frames come in a wide array of sizes, so verify the size of the space where the mattress will sit before buying a mattress. See the best twin xl mattresses. A full size mattress is 53” to 54” wide and 75” long. For metric users, these dimensions are roughly 137 cm by 191 cm. Another name for this mattress is a “double” mattress, but it isn’t intended for two people, since two people trying to share it would have only 27” of sleeping space. These mattresses are larger than the “small double” or “three quarter” mattresses found in some countries. Full mattresses are the ideal choice for heavier individuals who aren’t comfortable in a twin size bed. If you twist and turn a lot at night, you’ll probably want a full size mattress, as well. Full size mattresses are also attractive for those who want to have room for a child or pets to sleep with them. The mattress which has same width as full size but 5 inches more height than full size is called full xl mattress.The size of this mattress is 54″x80″.This mattress is suitable for the tall people who need more space to sleep.This is the best mattress size for active sleeper.Many people like this mattress . The standard queen mattress is 60” wide and 80” long. You really don’t find the plus or minus an inch difference between manufacturers with this size of bed. For metric users, the dimensions would be roughly 152 cm by 203 cm. Many queen beds have not only the standard bed frame and box frame but padding on the top that makes it hard to find sheets that fit. Queen sized mattresses are one of the most popular standard sizes, since couples that don’t toss and turn a lot and can sleep next to each other are able to share this mattress. The Olympic queen mattress, if you find it, is 66” wide and 80” long. These mattresses are attractive for couples that want to share a bed but need to maximize the space in their bedroom. The queen sized mattress is best suited to a room that is at least ten feet by ten feet. Note that the mattress’ dimensions are separate from the dimensions of the bed frame and headboard that can add inches in both directions. See the best Queen size mattresses. King size mattresses are 76” wide and 80” long. For metric users, the dimensions are roughly 193 cm by 203 cm. 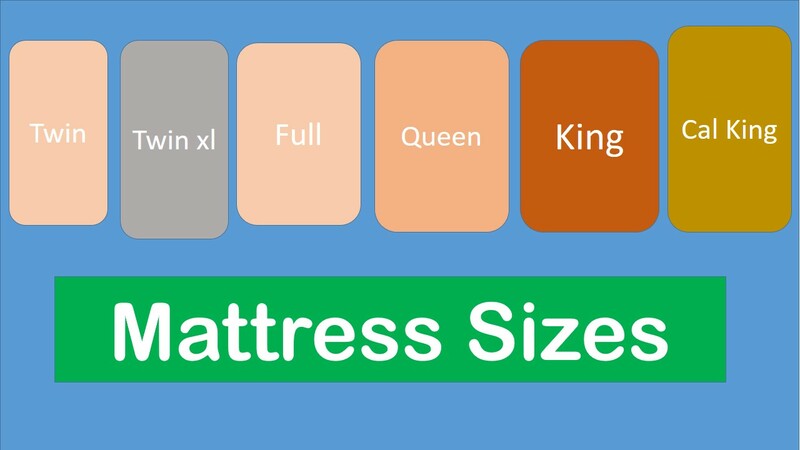 King mattresses are the largest standard size of bed available. If you buy a split king bed that has an adjustable base, you’re actually buying two twin XL mattresses. King mattresses are popular with couples that need a little more space than a queen size bed, since it is designed to let each person have enough room to stretch out. One benefit of king sized beds is that the box springs are split; this makes the bed easier to get up a flight of stairs and around tight corners. The king sized bed should only be put in a master bedroom that is at least twelve feet by ten feet. The Super King mattress or Texas King mattress is 80” wide and 98” long. These mattresses are hard to find. See The best king size mattresses. The California King mattress is 72” wide and 84” long. For metric users, the dimensions are roughly 183 cm by 213 cm. The California King mattress is thus a little narrower but several inches longer than the standard king sized mattress. It provides as much space per person as a twin XL mattress. These mattresses are invaluable for the tall owner who otherwise risks their feet extended past the edge of the bed. The extra few inches at the end of these beds makes them popular for use in adjustable beds, since the standard usable length is maintained even as the head or foot of the bed is elevated. In general, the California King mattress is four inches longer and four inches narrower than a traditional King mattress. If you’re looking for a California King waterbed insert, the dimensions are two inches shorter in order to fit into the water bed frame; this makes the California King water bed dimensions 70” by 82”. When You Should Change Your Mattress ?